Karl tells Zeke that he sees him and the other Kinski kids as part of his own family. Chris tells Pepper and Steiger that she's in a relationship with a woman. Pepper starts to laugh, reminding her mum that it's Christmas and not April Fool's day! She's convinced that Chris is making a joke in response to Steiger's proposal but, as the seconds pass, she can tell by the way her parents are acting that she's dead wrong and runs out. Janae and Bree can't believe it that Dylan doesn't feel anything for Sky anymore. Dylan argues that he still loves and cares for her but he just doesn't feel that way for her anymore. Janelle jumps to his defence; when a couple loses that special spark they should admit it and move on. JANELLE: Living without closure will kill ya – trust me, I know. Janelle can tell her kids are hiding something from her. Bree retrieves an envelope and hands it to her mother – it's from Kim. Chris leaves a message for Pepper, pleading with her to talk it through. Steiger thinks their daughter will need a bit of time – she has the same hotheadedness as he does. He asks Chris why she didn't tell them – or him, at least. Chris wanted to but she told her sister first and the reaction she got was so confronting it put her off. Steiger asks what she expected from ‘that old prude'. Chris realises she owed it to them to tell them and apologises. Steiger muses that it couldn't have been easy for her, turning her life around like that. Chris begins to tell him what a wonderful man he is but he cuts her short, telling her not to patronise him. He's a big boy – it's Pepper they need to worry about. Karl is raving to Zeke about how wonderful Christmas in Shepparton will be with Billy and Anne, among others, but Zeke only cares about Katya; he won't go without her. Karl tries to make him realise that his sister might not even get bail and, if she does, she might not even want to stay there. Zeke knows Susan will convince her. The door opens and who should it be but Susan and Katya. Zeke is so glad to see his sister – he knew she'd come home - and bounds up to give her a hug. Dylan appears and Sky is pleased to see him – she needs to speak to him too. They spend a few seconds arguing over who should go first until Harold tells them to cut it out. With Harold and Lou watching with great interest from the kitchen Sky asks Dylan what it is. Sky points out that he's staring at her. Dylan agrees- he's looking at her and doesn't feel anything at all. Not even when he looks in her eyes. He feels nothing inside for her. SKY: I don't float your boat anymore. DYLAN: Yeah, and I don't inflate your lilo. Harold and Lou are perplexed but Sky is relieved – she thought she was going to hurt his feelings. Dylan felt the same but she repulses him, as he does her. They hug, happy that their lack of feelings for one another are out in the open. Rosie is finishing off a call to Frazer when Pepper storms in. Boyd gives Steiger a beer on the house, having been able to deduce that he's had a rough day from the way he's flinging darts at the dartboard. Janelle appears and asks if she can join him. He warns her that he's not full of festive cheer but that suits her fine – she's no ‘bucket of giggles' herself. She confesses that she got a letter from the Kim – he's ditched her and the kids. Now she's wondering if he ever really loved her at all. Steiger knows how she's feeling, things having gone pearshaped with Chris. JANELLE: Pears are kinda shaped like teardrops, eh? Steiger shouts her a drink and offers to compare relationship disasters. Janelle agrees but makes him promise not to ask her where Kim's letter was postmarked. Steiger assures her that tonight is strictly off the record. Susan and Karl talk about Katya. Susan says she won't stay with them in order to protect them. Karl's worried about Zeke, who won't accept Katya staying elsewhere. Zeke and Katya appear, almost seeing their Christmas pressies! Katya just wanted to tell them how glad she is to be there for Christmas. Karl tells her that they're heading to Shepparton and invites her along but Katya says she has plans with some nursing buddies. When Susan and Zeke try coax her along Katya says it's Guy – she doesn't want to put them in danger. Karl is adamant that somewhere out the way like Shepparton is the best place for her. Whatever happens he and Susan will not leave her alone. Katya relents and agrees to come along. Once they've gone Susan remarks that she doesn't know how Karl will top that present to Zeke. Karl says that's her problem. Susan tells him that he was getting Zeke's present. Karl disagrees, holding up Rachel's present. Susan holds up a top – she got Rachel's present too, meaning no one got anything for Zeke. Whoops. Boyd is closing up for the night. Steiger feels so stupid and Janelle feels the same. She tells him that he had no idea Chris would ‘switch passports' and it's not his fault. It's not that he was a lousy husband and she decided to turn – that's not how it works. Steiger wonders how he could know her for that long and not know the truth. Janelle discovers that he and Chris were childhood sweethearts, just like her and Kim; the only true relationship she's ever known. Maybe that's why Janelle found it so hard to let go, being fearful of the unknown. Steiger wonders if his marriage was all a sham – did Chris ever love him as he loved her? She seemed to…but if he was *that* wrong about someone how could he ever trust his own judgement again? Janelle looks at him, sympathetically. Sky answers the door to Susan, who hopes she isn't intruding. There's an uncomfortable atmosphere as Susan tells her about Zeke's lack of present and wonders if Harold has any Crows stuff lying about that Paul McClain might have signed. Sky doesn't think Harold has anything so Susan proposes Harold arranging for Paul to sign some stuff for Zeke and getting a courier to pick it up. Sky isn't sure couriers work on Christmas day, leaving Susan in despair – she's the worst mother this side of Christmas. Then Sky comes up with an idea; Harold could arrange for Zeke to meet Paul. Harold emerges, a little sleepy, and Sky uses his appearance as an excuse to leave. Susan calls her back and wishes her a Merry Christmas. Sky wishes her a Merry Christmas too. Harold smiles at Susan. Rosie is working on Christmas day and Pepper is convinced she has a disorder; when things get tough she throws herself into work. At least she's not with Paul Robinson, although Pepper can't be sure – who knows, Rosie could've been with him last night, ‘like a hyena, feeding on Lyn's leftovers'. Rosie tells her not to pick a fight with her. Pepper tells her that she's ruined Lyn's life by snogging Paul. Chris appears and Rosie lets her in (although Pepper tells her not to). Chris tells her daughter that she's the most important person in her life but Pepper thinks it's another lie – how could she do this? How she exclude her from this other life? Pepper doesn't know her. Rosie tries to stick up for Chris but Pepper won't listen to her – she wants Chris to leave. When Chris says she'll come back later Pepper tells her not to bother. PEPPER:… I've got nothing to say to your lying face. Christmas morning with the Kennedy/Kinskis (minus Rachel). Karl and Susan present Katya with some cash to put towards the flat she's been talking about. Katya isn't sure about accepting it – they've already paid her bail. Zeke is more worried about the fact he can't find his present from them. Susan and Karl are saying how difficult it was to wrap when the phone rings. 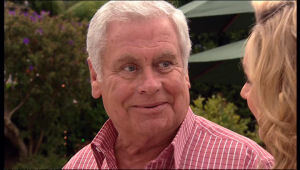 Zeke picks up (after Karl and Susan making it obvious that he has to be the one to answer it) and announces to everyone that it's ‘some guy that reckons he's Paul McClain'. Karl and Susan pretend to be shocked. Now it's time for Karl's present from Susan. She reaches behind the sofa and pulls up a guitar case. Karl is well chuffed; it's magnificent. Susan thought it would inspire him and manages to put him off playing his new guitar until later on. Karl has a present for her; tickets. Susan is delighted when she sees they are for London – and he's included Eurorail passes too! Zeke returns, a bit hyper with the morning's events. He jumps onto Karl and Susan and announces that he's got a training session with Paul (McClain). ZEKE: You guys are ace! Boyd and Janae are having a walk, wearing the personalised matching tracksuits that Janelle gave them. Janae is surprised to see Chris working at the garage and deduces from her that Steiger and Pepper know the truth. Janae asks why she's not with Carol. Chris says she would be welcome but it would feel disloyal to Pepper and Allan (Steiger). Janae is sure they wouldn't want her to be alone and asks her round to lunch. Chris doesn't want to run into Pepper but Janae thinks that might be a good thing. She and Boyd turn to leave. Chris reads the inscriptions on the back of their tracksuit jackets (Boyd's reads ‘I'm Janae's' and Janae's reads ‘Boyd's mine') and can't help but smile. Rosie tells Carmella over the phone that she can't attend the family gathering as she and Lucia still aren't talking. After she hangs up Pepper apologises to her and Rosie knows she didn't mean it. Pepper says she actually did – she can't see why she would be attracted to Paul when spunky Frazer is around. Rosie says you can't help who you're attracted to (just ask Chris). Pepper reminds her that she's not to mention her mum if she wants to keep their friendship. The girls exchange presents; Pepper has given Rosie a signed book by Sarah Mayberry (Sarah wishes her good luck on ‘getting experienced'). Rosie is surprised to see Sarah knows and tells Pepper she and Paul only kissed in the cellar. Rosie has got front row tickets at a Robbie William's gig for Pepper (who's convinced this is the first step to him falling in love with her). The Timmins boys, Zeke and Boyd play cricket. Zeke thanks Bree for the gloves she made for him. Bree doesn't mind that he didn't get her anything but he says he did and goes off to get it. Steiger says hi to Janelle, who's glad he made it. When he goes off to join in the cricket Janae asks her mum what's going on - Steiger's a free man now. Janelle is a bit miffed that Janae kept Chris's secret from her but seems to appreciate her daughter's loyalty to Chris. Janae tells her that there are plenty of middle aged women out there with a thing for cops on the rebound. Janelle reminds her that she isn't middle aged. Janae, deciding not to argue, pushes her mother in the direction of Steiger. Janelle offers to play a game with Steiger; if she catches the ball first then she takes him out on date. Vice versa and the date's on him. Steiger thanks her but he's not ready for anyone right now and he doesn't think she is either. Janelle looks over to Janae who seems a little disappointed. Boyd drops Janae off. Janae presents Chris with a basket of stuff from ‘the mountain of tucker'. She tells her that she's not alone and that things will work out. As soon as the dust settles Pepper will realise it doesn't really matter. Chris thanks her and they wish each other a Merry Christmas. When Janae returns to the car she realises that Boyd is looking at her. BOYD: Just thinking how lucky I am. JANAE: You'd better believe it! Sometime later, when Janae and Boyd have returned to the Christmas celebrations. As Katya and Sky watch over baby Kerry Lou asks Janelle if he can lend a hand. Janelle has it sorted but thanks him anyway. Lou tells her that she's a ‘good sort'. Janelle tells him that not everyone would agree with him. Lou wants to thank her for her friendship and understanding with Mishka. Janelle was happy to help a hopeless romantic. He asks about Steiger but Janelle says he isn't interested. Lou is certain he'll come around – she just has to wear him down. Zeke appears with Bree's present. What at first appears to be a pink blanket is actually a kitten called Willow, all wrapped up in it. Zeke tells her that he was going to be put down at the animal shelter – doesn't she just love him? Bree struggles to muster up enthusiasm. Once Zeke's gone to show Katya Stingray goes over to Bree. STINGRAY: Don't you hate cats? Janelle calls everyone over to thank them for coming along. She knows she hasn't seen eye-to-eye with most (okay, all) of them at sometime or another but she hopes she's won them over. JANELLE: And to those who've hurt the ones we love, like Paul Robinson who shall remain nameless, let's hope the new year sees them get what they deserve…so charge your glasses to absent friends. The crowd makes their toast. JANELLE: Here's to you, Lynnie. A car draws up at the foot of the street, out of sight of the gathering. Inside is Guy, who looks through some binoculars. He spots Katya and Lou looking at Willow with Zeke. Guy's phone starts to chirp and he answers it, telling the person on the other end that he can see her but there are too many witnesses. GUY: The right time will present itself! He hangs up and opens the glove compartment, retrieving the gun inside before taking another look at a happy Katya at the street party.